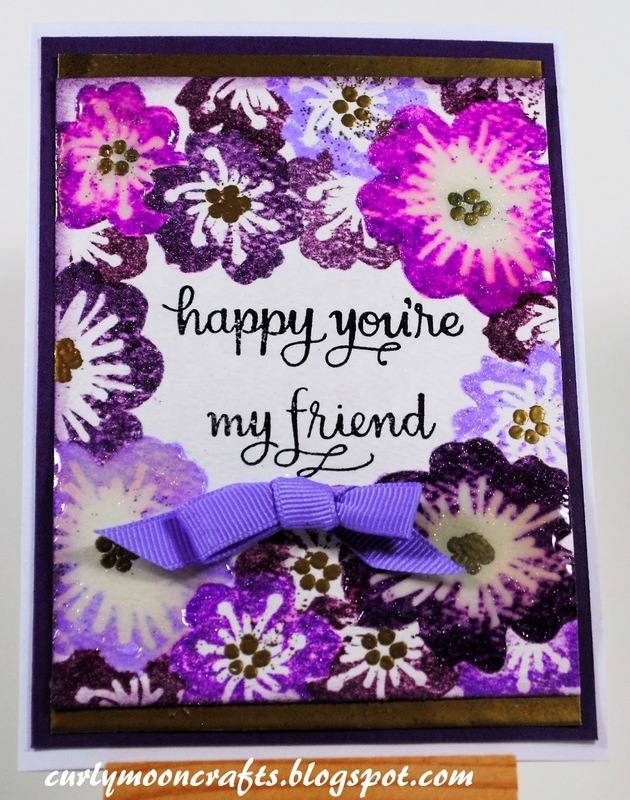 Hi Friends: Today's creation is a friendship card. I started with watercolor paper, then stamped my sentiment in the center. I used the purple Distress Inks to stamp my images around the sentiment, using masks to create the images. Once all of the images were stamped, I stamped the centers with Versamark ink, then embossed them with gold embossing powder. I used a Wink of Stella clear glitter pen and Glossy Accents to highlight some of the stamped images. While the Glossy Accents was drying, I used the Versamark and same gold embossing powder to create the gold strips behind the card panel. I mounted the card on a purple panel, then on a white card base. I finished it with a purple bow. (The card is prettier in person - no matter how many photos I took, I couldn't seem to capture the true purple colors and the glimmer of the Wink of Stella pen. Oh well - maybe I need to take a photography course!) Thanks for taking a peek. Have a great day! What a beautiful design, the colours look gorgeous. Thanks for playing at Simon Says Stamp Wednesday Challenge.